A big, central government wants to override laws approved by the people in the provinces. That might sound like the federal government bossing states around, but it's the Texas Legislature trying to rein in the cities and counties. Austin sounds like a miniature of Washington, D.C., in the growing legislative debate over local control — an overweening central government unhappy with a disorderly patchwork of local laws and preferences that interfere with intrastate commerce and the common good. A lot of this stuff is rhetorical — at all three levels of government — but there is something to chew on here, and a pile of proposed legislation on the subject. Who’s the boss, and of what, exactly? The debate has a distinct partisan tang, with most of the talk about stronger state control coming from Republicans in state government — the same folks who growl loudest when the federal government snaps the leash. More than a dozen proposed bills in the Texas Legislature would curtail local control in areas like taxes and oil and gas wells. One by Rep. Phil King, R-Weatherford, discussed in a House committee this week, would require local governments to seek permission before putting initiatives on the ballot. An example: Had such a law been in place, the city of Denton would have to have had permission from the state before asking its voters whether they wanted to ban hydraulic fracturing — fracking — within the city limits. Texas has survived decades of peculiar local laws and ordinances. Its largest city, Houston, has a loose idea of planning and zoning, for instance. Dallas used to have its own movie ratings and was an early adopter of a ban on smoking in public places. Cities all over the state have taken care of that blight for their citizens, without significant complaint, while the state Legislature has never been able to get that one into the law books. Texas cities tired of waiting on the Legislature have made it illegal to fumble with your phone while you’re driving a car. It is illegal in Austin to drive while using anything but a hands-free device, which means lawmakers are barred from texting on their drive to the building where they are, once again, considering laws against texting. They already live with it. Some localities have limited the use of plastic grocery bags, those nondegradable trash kites that flurry along the roadsides once their original purpose has been served. When Austin and others enacted those laws, they were razzed for their hippie granola laws. But those are the laws now in place. The outcry has been steady, tiny and notable for its source: Businesses are complaining while voters are silent or — as in the case of Denton — on the other side altogether. It’s a pain, many businesses say, to have different bagging rules across the same chain of grocery or discount or department stores, depending on whatever the local rules are. The Denton fight hinges, in part, on property rights and whether and how a city can limit them. And the list of potential issues to plug into this argument is a long one, dotted with issues like marijuana use, sanctuary cities and local minimum wage laws. Dallas Mayor Mike Rawlings, who like a lot of people in his position is pushing back against new limits on local control, says he has talked to Huffines and they’re trying to find common ground. And he said Thursday that legislative efforts to limit increases in local taxes will undermine public safety, limiting needed growth in fire and police services that already make up more than half of the city’s budget. 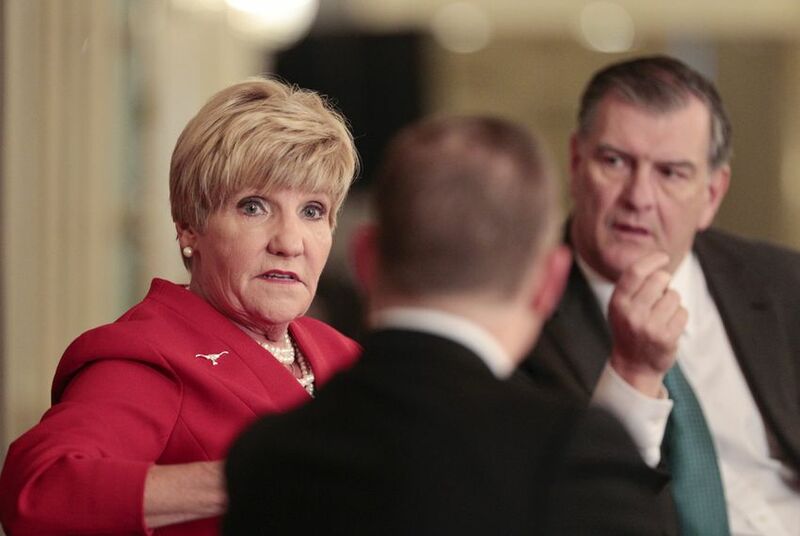 In an appearance at a Texas Tribune event with Fort Worth Mayor Betsy Price, the two said that differences between local laws just reflect the differences of the voters in those places. Price said people choose where to live based on differences like those. Disclosure: The Texas Public Policy Foundation was a corporate sponsor of The Texas Tribune in 2014. A complete list of Tribune donors and sponsors can be viewed here.